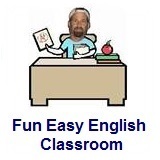 ﻿ Fun Easy English - new classroom free online classes english language lessons speaking listening writing reading october 5. 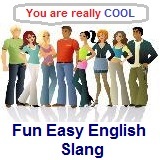 Today in the classroom you are going to learn some slang beginning with the letter S.
Today learn slang beginning with the letter S.
Shades simply means sunglasses and is often used in casual conversations among native English speakers in America. A good usage of this slang term is in the following song. Video: Timbuk 3 "The Future's so Bright I Gotta Wear Shades"